1. #11 Finley’sluckycharm, 2. #5 Golden Mischief, 3. #13 Marley’s Freedom, 4. #8 Mia Mischief. LONG SHOT: #6 Chalon. 1. #6 Rainbow Heir, 2. #9 Stormy Liberal, 3. #8 Chanteline, 4. #14 Conquest Tsunami. LONG SHOT: #12 Richard’s Boy. 1. #1 City of Light, 2. #7 Firenze Fire, 3. #10 Catalina Cruiser, 4. #6 Seeking the Soul. LONG SHOT: #4 Seven Trumpets. 1. #14 Eziyra, 2. #3 Wild Illusion, 3. #10 Magic Wand, 4. #13 Athena. LONG SHOT: #7 Smart Choice. 1. #8 Limousine Liberal, 2. #9 Roy H, 3. #2 Promises Fulfilled, 4. #1 Whitmore. LONG SHOT: #3 B Squared. 1. #13 Gustav Klimt, 2. #7 Expert Eye, 3. #8 I Can Fly, 4. #1 One Master. LONG SHOT: #2 Next Shares. 1. #2 Abel Tasman (BEST BET), 2. #7 Midnight Bisou, 3. #5 Wonder Gadot, 4. #11 Monomoy Girl. LONG SHOT: #8 Vale Dori. 1. #12 Waldgeist, 2. #2 Enable, 3. #5 Magical, 4. #4 Robert Bruce. LONG SHOT: #3 Channel Maker. 1. #7 West Coast, 2. #8 Pavel, 3. #10 Yoshida, 4. #6 McKinzie. LONG SHOT: #4 Gunnevera. OVERVIEW: On these big days you need to have a key horse or two and stick to it. That key for me today is Summering (15-1) in the Juvenile Fillies Turf. She did nothing wrong in two wins at Del Mar but then she got trapped at Santa Anita and had nowhere to go in the Surfer Girl, finishing third. I think she’s worth a shot. The main question today, like with all of the races on the grass, is the condition of the turf course. It has been raining for the last two days and the course won’t be firm. So whether she takes to the course will be a key as much as anything. Will the Euros have a bigger shot today on the turf? There are two schools of thought: 1) they have run on softer before; 2) they might have been sent to the States to run on firmer ground. We’ll see. FIFTH RACE (Juvenile Turf Sprint): 1. #11 Queen of Bermuda, 2. #2 Soldier’s Call, 3. #6 Moonlight Romance, 4. #5 Bulletin. LONG SHOT: #4 Stillwater Cove. This race was added by the Breeders’ Cup this year and it certainly came up tough with American and Euros plus males and females entered. There are six fillies in the body of the race. I went with QUEEN OF BERMUDA because jockey Flavien Prat should have some insight to the Euros and she looks like she can track the pace from the outside. SIXTH RACE (Juvenile Fillies Turf): 1. #12 SUMMERING (Best bet), 2. #2 The Mackem Bullet, 3. #6 Newspaperofrecord, 4. #5 La Pelosa. LONG SHOT: #11 Lady Prancealot. I’ve already made my case for SUMMERING. NEWSPAPEROFRECORD seems to be a lot of handicappers selection and I get, but I don’t like picking or betting favorites. SEVENTH RACE (Juvenile Fillies): 1. #1 Reflect, 2. #10 Bellafina, 3. #2 Serengeti Empress, 4. #4 Restless Rider. LONG SHOT: #3 Vibrance. I wanted to pick BELLAFINA but in looking at the workout times since her last race, I wasn’t impressed. Maybe she has topped out but I hope not for Southern California trainer Simon Callaghan. VIBRANCE is an interesting long shot as she finished second to Bellafina at Santa Anita. EIGHTH RACE (Juvenile Turf): 1. #6 Henley’s Joy, 2. #5 Line of Duty, 3. #2 Uncle Benny, 4. #14 Anthony Van Dyck. LONG SHOT: #13 Marie’s Diamond. OK, in the interest of honesty, Jeff Bloom, who owns Henley’s Joy, and I are friends, but I really like this 2-year-old. He tries every time and again the condition of the course will be the key. Internet reports are that he looks good and has trained good. LINE OF DUTY seems to be the wise guy horse and ANTHONY VAN DYCK seems to be the top hope from Europe, but he drew the No. 14 post. Ouch. NINTH RACE (Juvenile): 1. #9 Game Winner, 2. #6 Complexity, 3. #11 Code of Honor, 4. #13 Topper T. LONG SHOT: #4 Tight Ten. This race seems pretty straight forward, but that’s when chaos happens. If the favorites don’t show up take a look at TOPPER T, TIGHT TEN and KNICKS GO. Preview: There is a chance of rain for the return to Santa Anita so the turf races could be in danger of coming off. It’s looks like Rafael Bejarano is new top rider for the Bob Baffert barn after a falling out with jockey Martin Garcia. Also top jocks will be missing for much of this week to ride in Kentucky for the Oaks and the Derby. #3 Emmzy (5-2): This filly from the Bob Baffert barn cuts back a half-furlong, which is a little surprising knowing haw the trainer likes to stretch them out. Rafael Bejarano takes the mount and he’s tough to beat in the stretch. #4 Tribal Again (6-1): There is a ton of speed in this race and this gelding seems like the only one that come from off the pace. There is a big jockey upgrade to Flavien Prat, who is 24% with trainer Peter Miller. I’ve told many people that I would describe myself as a good handicapper and a bad bettor. I just haven’t mastered that part of the game like my Del Mar boothmate, syndicated handicapper Bob Ike. This past weekend proved my point again. A lot of it is my own fault for being too much of a football fan (and bettor) watching games and playing tracks in New York and Kentucky. Then all of a sudden it’s 12:30 p.m. and Hollywood Park is going off and I don’t have a wager put in for the Players Pick 5 which costs 50 cents per combination. On Saturday, that mistake cost me $4,367.40. The first three races were taken by my second choices in my handicapping on this blog. The last two races were won by my top pick. So for a paltry $4, I could have won a lot of coin and when you have COBRA payments every month, that’s a lot of green. Of course, the kicker was the key race was the third when maiden Arethusa, trained by Eoin Harty, won a stakes race as a maiden, paying $23. I gave out that horse earlier in the meet here and on Horse Player Now, but did I bet her on Saturday? Nope. Even after doing well in the Pick 5, I didn’t bet my long shot, Tebowing ($24.40), in the sixth. No, I made one bet, in the ninth on Magic Number ($9). Sure I won but not a satisfying day from a betting standpoint. So on Sunday, I didn’t have a real good feeling, and I was right, at least early on the card. I was horrible in the first five races, but as the late Pick 5 approached, I thought my luck and handicapping had to change. Again I was watching the Chargers and Red Zone (love Red Zone) plus a friend’s mother needed a ride to the ER so off I went. When I got back I found my long shots Casey’s Clem ($40.60) and Empty Headed ($8.40) won the sixth and seventh races, respectively. My second choice Global Hottie ($3.40) took the eighth —- here’s a hint in following my picks, I rarely put an even-money shot on top —- and finally my third choice, Warren’s Judy ($20.80), won the last race. The payoff on the Pick 4 was $942.40 and I had none of it. So a good weekend of handicapping and another weekend of bad betting or non-betting, whatever the case. So frustrating, but I’m sure everyone has stories like this. I just needed to vent. Now onto handicapping this week’s cards. Just a reminder jockey Agapito Delgadillo is serving a suspension so he won’t be around this weekend so don’t worry about horses he is replaced on. Trainers are still looking to replace Julian Leparoux, who has moved back to the Kentucky circuit. Check what jockeys are getting calls in his spot for Mike Mitchell (Leparoux’s father-in-law) and Jerry Hollendorfer. FIRST RACE: 1. Do Some Magic, 2. San Onofre, 3. Dreamnofatticus. LONG SHOT: High On Final. SECOND RACE: 1. Visions of Candy, 2. Kevin’s Kool Kat, 3. U R My Candy Gir. LONG SHOT: Lethal Miss. THIRD RACE: 1. Boyett, 2. Sinfully, 3. Persuasive Paul. LONG SHOT: This One’s for Mel. FOURTH RACE: 1. Still Unbroken, 2. Infosec, 3. Tax Enough. LONG SHOT: Papa Smitty. FIFTH RACE: 1. Dolphins Shorts, 2. Tiz Anna, 3. Flashy Dame. LONG SHOT: Holiday N Newport. SIXTH RACE: 1. STREAMING (Best bet), 2. Artemis, 3. Abide in Me. LONG SHOT: Red Barris. This is the time of the year that trainer Bob Baffert starts sending out his late-blooming 2-year-olds and that’s what we have here in STREAMING. 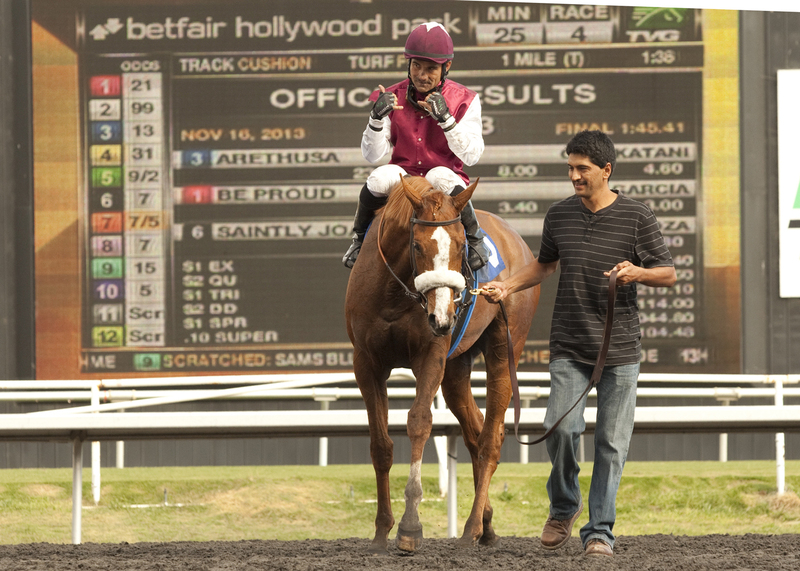 This daughter of Smart Strike has been training in typical Baffert style: fast. The barn’s main ride, Martin Garcia, rides and this one looks ready to go. SEVENTH RACE: 1. A Toast to You, 2. Camp Victory, 3. Gonna Fly Now. LONG SHOT: Silver Dragon. EIGHTH RACE: 1. Bertran Hill, 2. Sandys Diamond, 3. Dugan Bill. LONG SHOT: Decarchy’s Trieste.